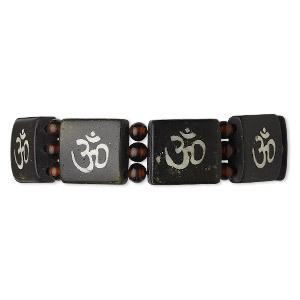 Bracelet, 3-strand stretch, bone (dyed) and glass, black and brown, 17x17mm flat square with Om symbol design, 7 inches. Sold individually. 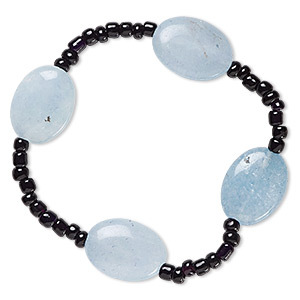 Item Number: H20-3186JE Have a question about this item? 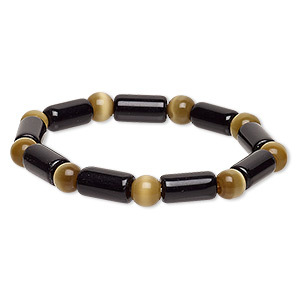 Versatile black bone stretch bracelet features the powerful Hindu and Buddhist Om sign. It is believed the Om sign has over 100 meanings universally. 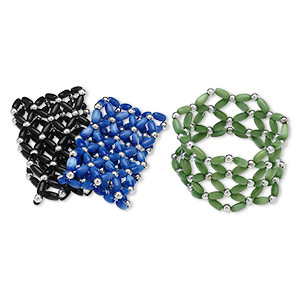 Three tiny glass beads align and separate each bone square. 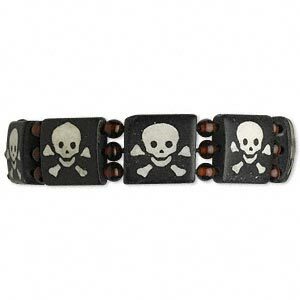 Bracelet, 3-strand stretch, bone (dyed) and glass, black / white / dark brown, 4.5mm round and 17x15.5mm flat rectangle with skull and crossbones design, 7 inches. Sold individually. 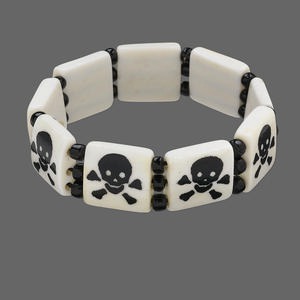 Bracelet, stretch, bone (dyed) and glass, white and black, 4mm round and 16x16mm flat square with skull and crossbones design, 6-1/2 inches. Sold individually. 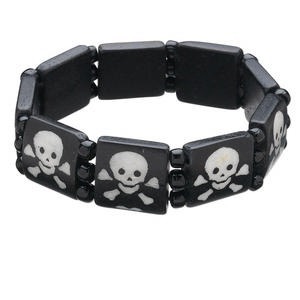 Bracelet, stretch, bone (dyed) and glass, black and white, 4mm round and 16x16mm flat square with skull and crossbones design, 7 inches. Sold individually. 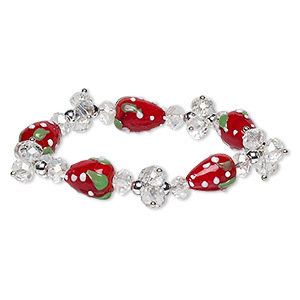 Bracelet, stretch, acrylic / glass / lampworked glass / silver-coated acrylic, multicolored AB, 17mm wide with strawberry, 7 inches. Sold individually. 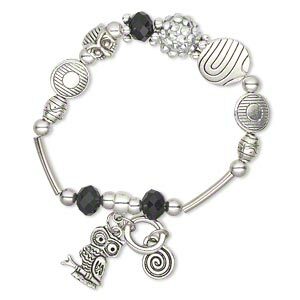 Bracelet, stretch, glass and antique silver-plated "pewter" (zinc-based alloy), black, owl, 6-1/2 inches. Sold individually. 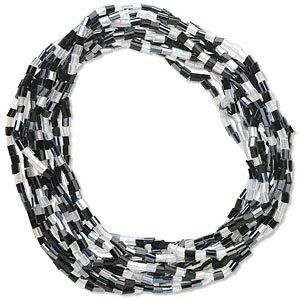 Bracelet, stretch, glass, black and white, 2mm wide, 7 inches. Sold per pkg of 12.